Hayduke loves water, so when when we decided to buy boats early this year, it seemed unkind to consider getting into a hobby he'd love, in a way that excluded him. 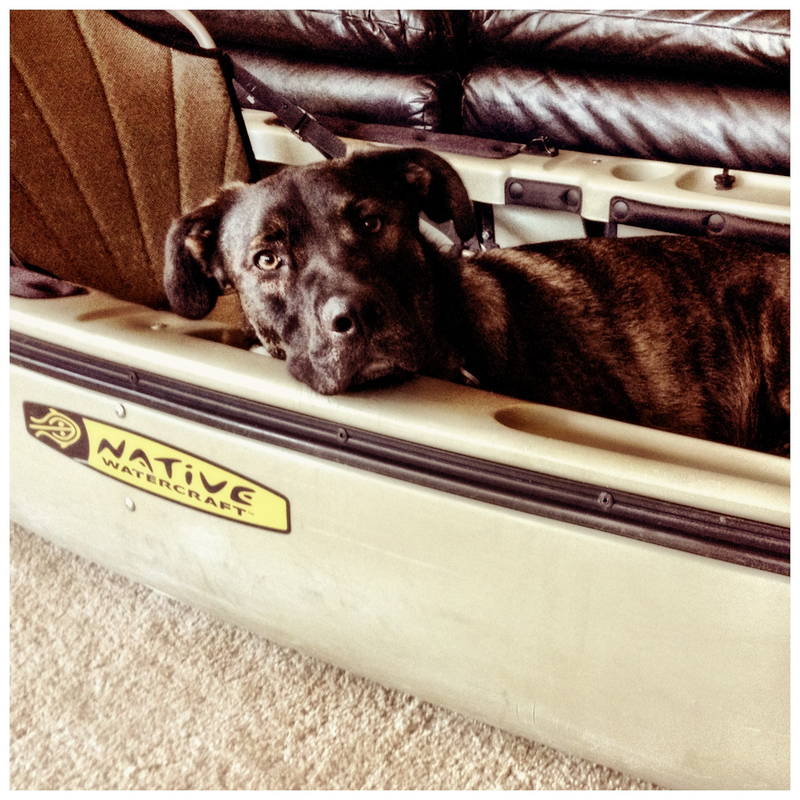 So I chose my boat with the intention of paddling with Hayduke. We brought him with us to the lake when we tested boats. I only looked at buying boats that his wet doggy body would fit in, and that he could get in and out of while out on the water. We practiced. 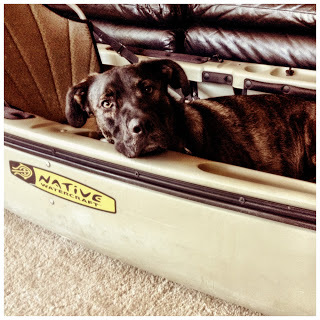 I chose the Native because it seemed to work well for this, and once home, I put the boat in the living room floor and taught him to get in and out of it, and encouraged him to lie down inside. A fat lot of good THAT did - the dog more or less totally refuses to get into the boat on the water. I've tried and tried to teach him to ride with me. I've put soft things in the bottom so that it would be less slippery. I've tried using a tab on his pinch collar to hold him. I've tried bribing him with snacks. I've given up. It's not that he's afraid of the boat, or uncomfortable in it. It's not that he's bad, or that he doesn't want to please me by doing what I ask. It's just that, plain and simple, he loves swimming so much that nothing else matters.Now that I've given up on getting him to ride with me consistently, my tactics have changed. I'm not even trying to keep him in the boat now; I've been teaching him to recall to the boat so that he'll come back to me if I see a strainer or a dangerous rapid coming up, and I'm teaching him not to try to get into other peoples' boats. 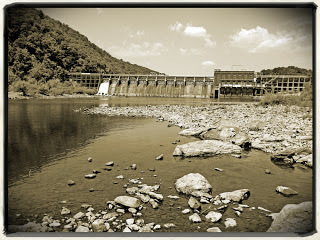 And I'm sometimes going without him, when the river isn't easy enough for him to be safe swimming solo. 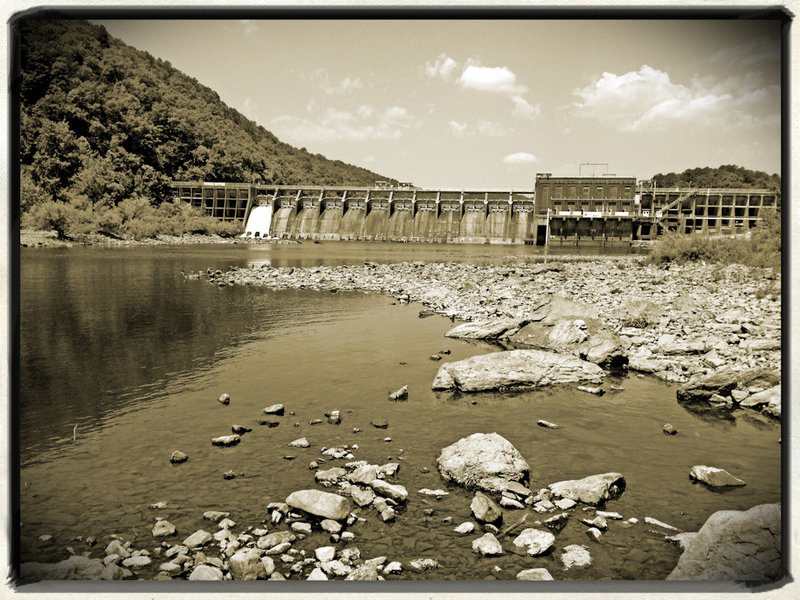 Our favorite dog-paddling river is the Ouachita, between Remmel Dam and Rockport. It's five miles of calmly moving water interrupted a few times by short rapids that he can handle (and seems to enjoy) on his own. He can swim the whole way himself, though he knows that my boat's available if he gets too tired and wants to hitch a ride. One of the funnier things about Hayduke's near-total devotion to water is that while he loves to swim, he hates being wet. 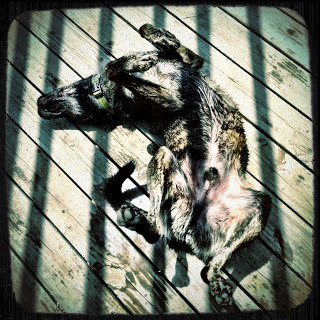 As soon as he's out of the water, he's rolling on his back, making awful growly grunty noises, trying to dry his fur. Silly dog. And so, as with many things that begin with good intentions, research, and careful choices, my plan to have a water dog has been met with total and absolute failure. But, there are a great many things that don't work out the way we'd planned. Sometimes they work out better, if we let them. We've ended up with a great water dog - just not exactly in the way we'd intended.